Information. Food. Attitudes. Drinks. Vibes. The media. Thoughts. Let’s look a little closer at this. Consumption is something we do…EVERY day. Starting from the time we get up – whether it’s watching the morning news or having breakfast or time in personal thought or whatever it is that begins our day…we consume. And that continues throughout the hours of our day.The thing is…what we are choosing to consume…is it what truly nourishes us? Or, do we sometimes (oftentimes?) over-consume? It’s easy, isn’t it? It’s easy to over-consume. I’d like to talk pineapples. When I was in college (wow…and that was a while ago! ), one particular evening was an all-nighter, getting a project done by the time it was due (why did we wait until the last minute, anyway???). Somehow we finished the project we were working on, and were able to get it turned in on time. In a state of tired-ness, and fueled by coffee – my roommate and I decided to also fuel our bodies with a pineapple (sounds like a good thing, doesn’t it?). A pineapple – a healthy fruit! And we cut that thing up…and ate the whole thing. Well…almost immediately after finishing (or really – a little before we finished), my mouth began to burn. The acidity of too much pineapple had created a burning sensation in my mouth. Ouch!! A fruit – something that is filled with nutrients…and I had over-consumed! While it might not always be so obvious, I’ve continued to over-consume time and time again – of both “good” things and “bad” things. And I venture to guess that you have, too. And maybe even more important – are you consuming more than you really need? My challenge to you, as you begin this month of November – and we approach a season that can very much be excess-filled (the Christmas season, here in the United States), is to really (and objectively) look at your own personal consumption habits. What are you choosing to consume? Does this fit with the life you desire? Don't stop there, though – are you consuming more than you really need, and is this in any way limiting you from reaching toward the life goals you have for yourself. Or maybe – is what you are choosing to consume – is that limiting you from identifying your own personal life goals? Think about it. Think about it, and be mindful of what you choose to consume. You CAN create the life you desire! I think most of us over consume- things that we actually don’t really need, but because we are so used to doing so- we carry on with the same habit. I had read somewhere once that very little is needed to make a happy life. Even if we have less we can be satisfied- only if we want to be, on the other hand even if we over consume or have excess- we may never be satisfied and would want more. Habits! Yes, that’s it – we do some of this long enough that it just becomes habit – and we don’t even think about it. Thanks so much for being here and for sharing your wonderful thoughts. You grew up on a pineapple farm!!! Wow!! And…I can also see why you never wanted to see another one again (too much of a good thing…). Thanks for this great insight into consumption. Time and again I am reminded to live a life that is meaningful and valuable to me, and to do this I must be mindful of how I choose to spend my energy and what I choose to consume. I can nourish my body, mind and soul with positive, healthy choices, balancing action with rest. My other option is to overindulge in whatever happens to be in front of me- be it snacks, stress, negativity or expectations. Ultimately I’m responsible for my well-being, and I choose to take good care of me. That’s it – what’s meaningful to each of us – and how are we choosing to spend that time. Positive and healthy (I say that now…as I’ve just finished a mini Milky Way bar…) choices, consumed in moderation – lead us toward a life of abundance. I love what you have shared here, and how you have tied it all in with well-being. 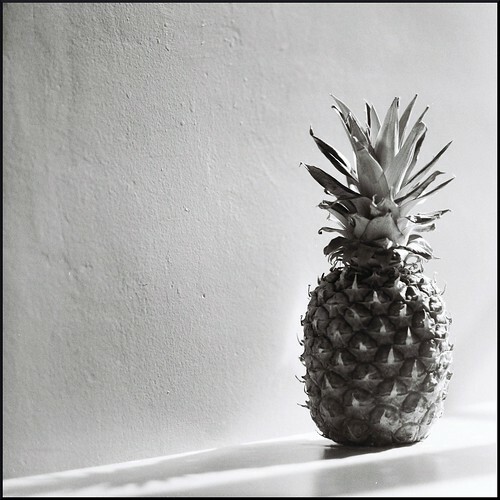 That’s a great story about the pineapple and a great illustration of over-consumption. My sister and I were talking about that last night on the phone. I come from a food loving family and we always have the tendency to overdo the food when we have company, etc. We vowed then to watch that in the future. Mmmm…I can relate to that over-consuming of food when we’re amongst company! And – as I think about the upcoming couple of months – there are definitely moments where this will present itself. And…it’s a choice. I can choose to overdo it…or I can choose to eat in moderation. Hi Lance! OMG yes aren’t we OVER consumers? I love the quote at the top “He who seeks more than he needs hin­ders him­self from enjoy­ing what he has.” I’d add to that taking more than you need may leave less for everyone else! I am working with clients, a few of which are obese and struggling to drop a lot of weight, who had no conception of serving sizes, let alone nutrient-rich content. We need a lot less food if the food is the right food! This is such a great point – when we take more than we need, there is less for someone else (I think of starving people in this world, while here in the US we have way more than we need). And we get used to what we have (the excess) – which can easily lead to weight gain when we talk about food. And it’s a hard habit to break – especially when we are around others who do this, too. So, what you are doing, Suzen, is a real gift – coaching others to eat healthier (and less). Very important message!!! Yes, I have been there. Right now, money is so tight that I don’t even have the ability to try that – ;-). You certainly learn how little you can live on…. That’s a great point, too – limits (like money) can sometimes actually help us to not over-indulge. Well I am certainly consuming “the Jungle of Life”…..still loving that “Music for the Soul”. Anyways, I try to consume “knowledge”. Finding out more…..of what’s out there & more about me…..my strengths & weaknesses. I am continually determining how I consume my time…..is it with the important things or am I consuming too much “un important time”? Thank you Lance, there is a lot more to “consumption” on a personal & global level. This is a really great point – it’s as much the “what” we consume as the “how much”. And it is certainly great having you here, consuming the words (and music) in this space. Great, great thoughts, David – thanks for sharing all of this! I like how you weave your pineapple-eating experience into a lesson on over-consumption. Coincidentally, I have been looking into healthy eating more recently. Shifting into a more vegan diet has also been a gradual process for me. Save for knowledge and wisdom, less is certainly more! When we look at our health, over-consumption is definitely a major thing these days. In fact, I think about the vacation I’ve just returned form – and how easy it was to eat a bit more than I normally do. So, focus in this area is a really good thing – wishing you much success in the changes you are implementing. I like your word of focus for November…consumption. Such an important idea…especially, as you said, we are hitting the holiday season. I like your story…it’s such a great lesson about moderation – even the good stuff. Your post is a great reminder to me that I need to be more mindful about the things I consume and the things that consume me. Great post at the perfect time. Thanks Lance! Ahhh…I love how you have stated this –> “…be more mindful about the things I consume and the things that consume me” –> yes! Yes, there really IS such a thing as too much of a good thing!!! This is a wonderful reminder to be mindful as we approach the excess of the holidays. I appreciate you putting out the challenge for everyone to be aware of what and how they are consuming. My question to you: Do you still like pineapple?? lol! And, to your question: yes, I still very much love pineapple (I just limit how much I eat!!!)! Great story Lance and a great lesson to learn. I guess you could say that I have learned not to over consume. Even when i am working on my blog or writing I know when my body or mind tells me that is enough for the day. Over concuming can drain us. Make us less productive. Many things, likea pineapple are good for us, but we have to learn to know when enough is enough. As I think of this post, I think for people that always buy a lot stuff. They get consumed with a lof stuff, then consumed by a lot of bills. You are right, we do have to stop any habit that can consume us. Thank you Lance for the reminder. Love this post. That’s great awareness – knowing when “enough is enough”! And what a great point – when we over-consume with the stuff in our lives, we have the bills to come back and consume us –> something very well worth remembering. Thanks, Debbie, for your very thoughtful comment! Hmm, I was just polishing off a whole packet of grahm crackers as I read your post. Probably didn’t need to eat all of those! What a good reminder as we head into the holiday season. Ha!! And…ummm….I probably didn’t need that leftover candy bar from Halloween either (that I just finished!)!! I love Pineapple but I also know how acidic it is. Yes, I have and sometimes still do over consume on things including blogging. I remind myself to be conscious of what I am doing and to notice if I am over-consuming something. Sometimes we get tunnel vision and do not pay attention to our actions. …and I’ve been there with blogging too (it can become addictive, can’t it!). When I pause, though, and really look at my life – that’s when it all start to fall more into perspective. That’s a wonderful story that combines the pineapple and the illustration of over-consumption. One of the worst habits of our time is that the majority of people combines on their mind, that what they are or worth is synonymous to what and how much they consume. That’s why we see people trying very hard just to get the latest and more expensive products. Very nice post Lance, thanks for sharing your insights. I like eating pine apple but if you are going to eat more you become acidic.. What a good reminder as we head into the holiday season. Yes…pineapple is definitely acidic (and I found that out the hard way, huh!!!)!! Dave’s hangin’ up the helmet, huh!! You sound like you are a okay with that!! Thanks for sharing your own pineapple experience (which definitely sounds worse than my little “sore mouth”). Too much of a good thing! What a great metaphor for so much in life. I really enjoyed reading this Lance! Thanks Betsy – it’s great having you here! I’m right with you Lance… I’d say 99% of the United States population over consumes. I’ve been guilty of this for just about my entire life. A side-benefit of living primally is venturing into the world of minimalism. I started my minimalism journey about 4 months ago and it continues to get better. It can be scary at times but having LESS allows me to enjoy what I have MORE. This is of course the most important things in life… Family, Friends, sleep, relaxing, playing, joy, passions, etc. I’ve learned to slow down. It’s not always the case but more and more I take the time to make a good meal and then sit down to actually enjoy it. I don’t watch TV or do anything else while eating… I just eat and converse if I’m eating with others. I enjoy the flavor of the food MORE. Bonus! I love this – what you are doing with minimalism! And especially – how it makes what you have just that much more meaningful. Enjoy the food…and this wonderful life you are creating!